Awesome high-quality tie bar and cufflinks set from DC Comics! Represent the Man of Steel on your clothes. Show your love for Superman! Show your love for DC Comics with this amazing tie bar and cufflinks gift set! 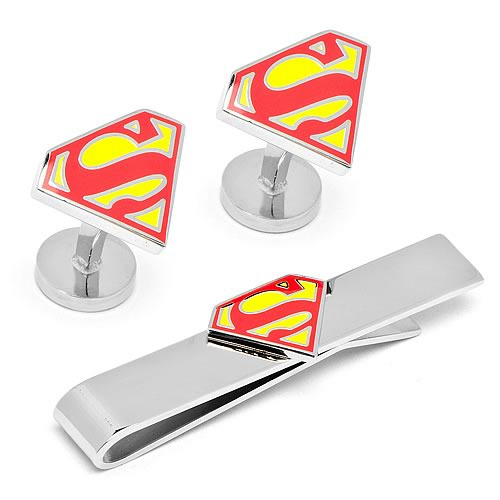 The Superman Shield Logo DC Comics Cufflinks and Tie Bar Gift Set is the perfect way to subtly style your geekdom in a classy and reserved manner appropriate for any upscale event. With this awesome tie bar, not only can you show everyone around how much you love Superman, but you'll also be sporting some stylish formal-wear jewelry that features Supes' iconic blue and red shield logo! Made from enamel with silver plating. The Tie Bar measures about 2-inches wide and the Cufflinks measures about 3/4-inches wide.